In the tax code overhaul approved in December, the $3.8 trillion municipal bond market retained its tax-exempt status and was largely unchanged. However, the market will likely see a reduction in supply in 2018 because of certain provisions in the new law. The Tax Cuts and Jobs Act represents, on some measures, the biggest change in the tax code since President Reagan’s Tax Reform Act of 1986. One thing that didn’t change is the exemption for municipal bonds. Congress has talked about limiting or eliminating the tax-exempt status of municipal bonds since the flat tax debate in 2010, but that idea did not make it into the final legislation for 2018. At the same time, the overhaul included a provision that is likely to influence technical factors in the market. The tax reform eliminates tax-favorable treatment of advance refunding bonds. It could easily result in a 20% reduction in the annual supply of munis. A refunding occurs when an issuer refinances a bond by floating a second bond at a lower interest rate. Paying off the older, higher-yielding bond reduces the issuer’s interest costs. 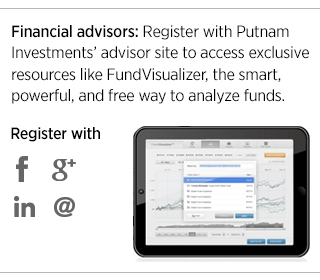 Advance refundings represent a significant portion of the muni market. 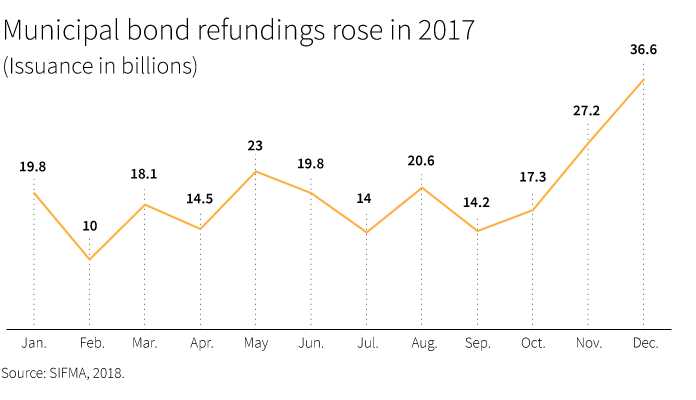 In 2017, refundings accounted for 54% of total issuance for the year (SIFMA). Foreshadowing the potential consequences of the repeal, many issuers in the weeks leading up to the tax reform vote rushed to refund in anticipation of the new tax landscape. While the supply of municipal bonds could see some fluctuation, the demand for municipal bonds is expected to remain largely stable. With the marginal income tax rates for individuals staying basically unchanged in the new structure, demand on the part of individuals is not expected to change significantly. In fact, as the new law caps state and local tax deductions, there may be increased demand by investors in high-tax states seeking to capture the additional tax benefit offered by state municipal bonds. Corporate investors, on the other hand, may find munis less compelling, given their lighter tax burden under the reform. This could lessen demand for munis from banks, property and casualty insurers, and other institutions. Banks have more than doubled their investment in municipal bonds in the past 10 years. Any significant interruption in bank demand has the potential to weigh on the prices of long-maturity municipal bonds. While activity in the banking sector warrants monitoring, we believe that demand from the sector may be relatively stable in the coming year, at least. A risk that is not unique to the municipal bond market involves discovering the unexpected effects of new legislation. This is particularly true given that this complex tax package was put together in a short amount of time. Indeed, the fact that Congress advanced the legislation in roughly three months indicates that there was little time to articulate many consequences for the economy. We will be monitoring the market closely to identify how participants are responding to the new law, and we will be watching for unexpected developments.